Camping in plain site has become the new norm. If you drive around Mountain View, California – specifically around the Google campus you will notice RV’s and vans littering the streets. Some of these “campers” are a click above homeless and some are young tech workers. Either way, the trick to succeeding is hiding in plain site. In other words don’t use an RV, use a van. In this case, a tiny van. This inexpensive option, the Cascade Camper Kit, pimps out the Ram Promaster City van. For about $7,000 you can convert your Promaster with a kit that includes a living space for two, double bed, solar-system, and kitchen. The brains behind the Cascade Camper conversions is Zach Yeager who has been living the #vanlife for about 30 years. He started out with a VW camper bus and has evolved his system to the Ram Promaster City for the new base. He left his corporate job and has now found success in this popular van conversion system. 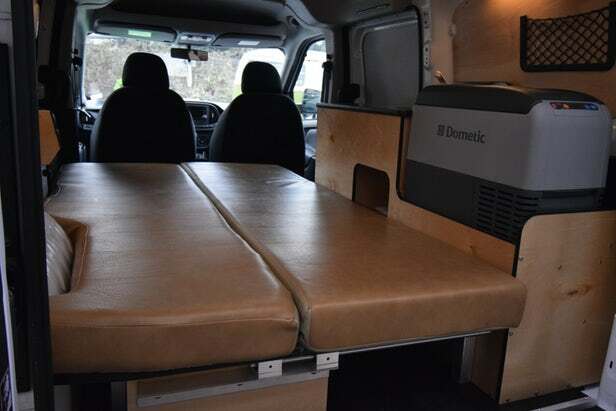 The heart of the Cascade Camper design is the futon-style sofa the tis mounted longitudinally down the drivers side of the van. 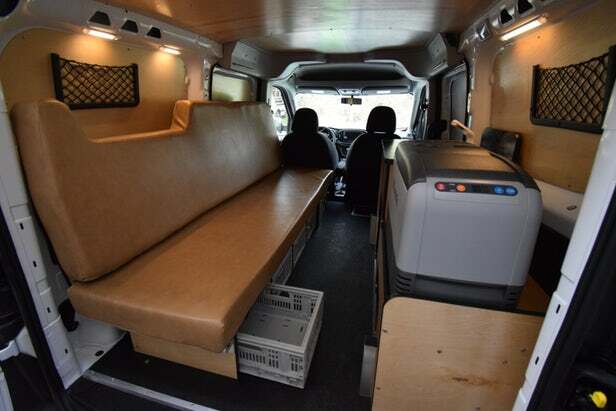 This couch drops down to fill out the rear of the van with a 42 x 76-inch double bed. Next up, a compact kitchen block on the passenger-side with a refrigerator and sink. Under the counter is a 19-L can with quick-release water lines to the sink. Cooking is by way of a single-burner butane stove that can be used inside or outside of the van. Electrical power is fed from a 100-watt roof-mounted solar panel, a 400-watt power inverter, electric outlets, four usb ports, and a 75-Ah AGM battery. There are LED lights and a 6-inch ventilation fan as well. Storage comes in the form of five slide-out bins below the sofa, cubbies and shelves in the kitchen area, and net pouches on the walls. A finished look is created with privacy curtains and wall and ceiling panels over top of 10-mm closed cell foam insulation. 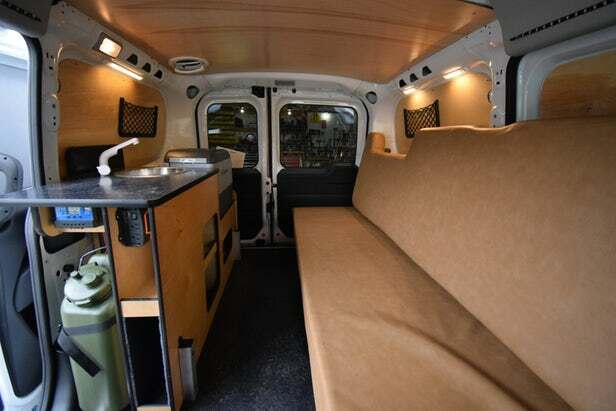 The Cascade conversion is compatible with 2015+ Ram Promaster City Cargo vans (not the “Wagon” passenger models) and retails for $7,000, roughly half the price of the Contravans conversion and closer to the $4,700 Wayfarer kit that includes structural components and furniture but not kitchen equipment or electrical hardware. 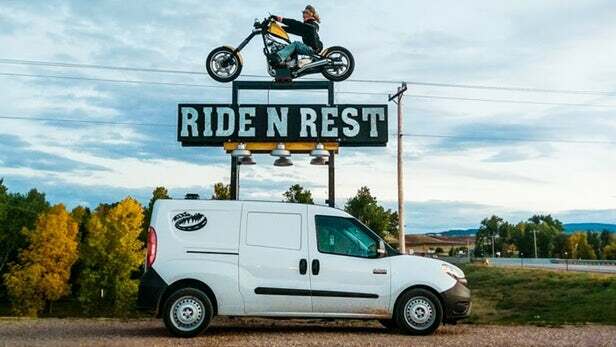 Buyers source their own vans, and with the Promaster City’s $24,000 base price, they’re looking at as little as $31,000 to get a brand-new camper van on the road – about as cheap as we’ve seen, and it only gets cheaper for those buying used vans.